The extraordinary combination of plum and nectarine flavors on top of the flakiest crust ever! 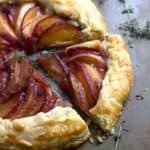 This plum nectarine galette is fantastic!! Finally, slowly pour in milk or water around the entire mixture in two intervals, using your hands to begin bringing the dough together. After the last milk addition, shape the dough with your hands into a flatter ball disk. Wrap the ball in plastic wrap and place in the refrigerator for at least 1 hour. Roll out cold dough to size of your liking then alternate plum and nectarine slices in a circular pattern to the center of the dough leaving at least one inch of pie dough on the outskirts to fold over. Next sprinkle sugar and cinnamon over slices then fold over the remaining pie dough. Brush egg wash over dough. Bake for 30-40 minutes or until filling is tender and bubbly and crust is golden brown. Serve with my Big Mama's Vanilla Ice Cream if you really want a treat!